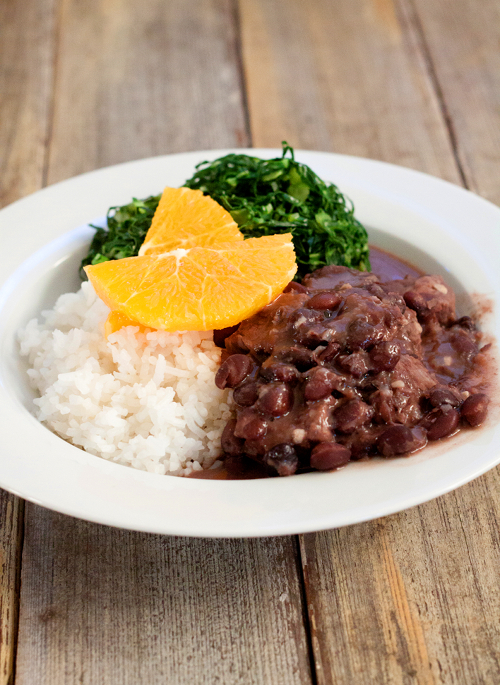 Feijoada is not your everyday kinda meal. I mean, there is a reason why Brazilians say that they eat Feijoada on Saturday, so they can have a day to digest and rest. This thing, while unbelievably delish, sits like a brick in your stomach. And don't even think about calories, because the moment that first spoonful made it into your mouth, you can kiss your dreams about wearing cute bikini next summer goodbye. That's why we need to eat it with Couve, guys. Yep, that garlicky stir-fried shredded collard green is the antidote to Feijoada fattening attributes. And those orange slices should bring the calories down to 200 per-serving. 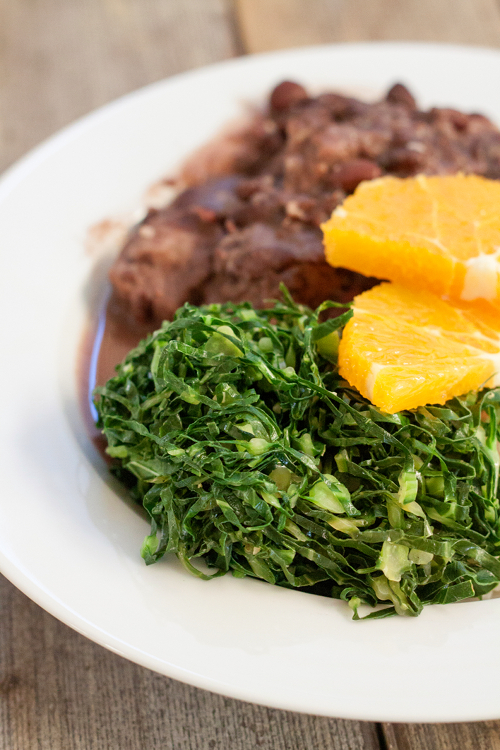 Serve Feijoada with sautéed collard greens, toasted Manioc meal, steamed rice, orange slices and hot sauce, if desired. Soak the beans overnight. In the morning, boil the beans for about 4 hours over low heat, until tender. Set aside to cool down. Take about 1/3 of the cooked beans and mash using food processor. Boil carne seca, ham hocks, beef, pork, and sausages in a large dutch pan. Reduce the heat and cook the meat until tender but not shredded. Drain the water and excess fat. Set aside. Using the same dutch pan, heat the oil, sauté onion, garlic and bacon until well cooked. Add mashed beans, the remaining black beans and cooked meats into the pot. Add bay leaves, season with salt and pepper. Reduce the heat, continue cooking for another 20-30 minutes. Heat the oil in a frying pan, add garlic and sauté until cooked. Add collard greens, season with salt. Cook until greens are tender, about 3 minutes. Melt butter in a medium pan. Add onion and cook until soft. Stir in manioc flour, cook for about 3-5 minutes until well toasted. Season with salt and pepper. Now there is no need to worry for money. Live life without any restrictions and enjoy the free cash from paypal. Visit get free paypal money to get free paypal money adder and using this money adder generate unlimited free paypal cash. Hurry its real and working. Now there is no need to worry for money. Live life without any restrictions and enjoy the free cash from paypal.